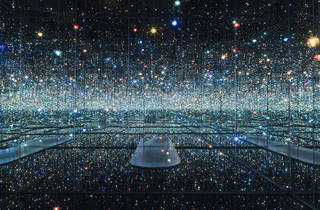 Photograph: Courtesy the Broad Art Foundation Yayoi Kusama, Infinity Mirror Room. Think of a visit to the Broad a little bit like a trip to Disneyland: You could go in cold and have a perfectly enjoyable time, but to make the most of your visit you’re going to want figure out where to park and what do first. Though you won’t find amusement park attractions at the Broad, you will find familiar queues, timed tickets and coveted reservations. To make the most of your time at L.A.’s most in-demand contemporary art museum, we’ve pulled together six things you should know before stepping foot inside. 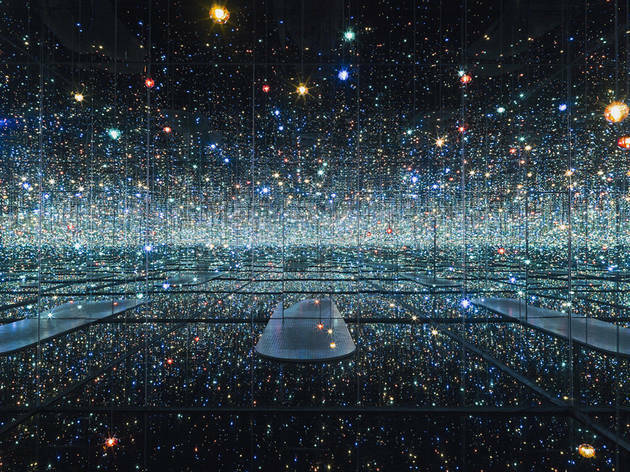 Yayoi Kusama's two Infinity Mirrored Rooms have dominated Instagram feeds since the Broad first opened (first with the twinkly Infinity Mirrored Room—The Souls of Millions of Light Years Away and later with a second permanent installation, Longing for Eternity). That you can only spend 45 seconds in these tiny, twinkly chambers should tell you everything about the popularity of the museum’s current must-see installations. You can’t make a reservation in advance, but once you arrive at the museum make a beeline for the tablet stationed in the lobby; there you can punch in your name and phone number to secure your spot in line for one or both installations (we suggest both, but if you can only do one the Souls… piece is the one to see). Expect virtual wait times to climb well above an hour; you’re then free to wander the museum until you receive a text 10 minutes before your return time. Museum smartphone apps are often clunky and single-use, but we kind of love the Broad’s. It features location-aware audio guides that include everything from artists talking about other famous artists to a kids’ guide narrated by LeVar Burton. The guides work outside of the museum as well and are actually compelling enough to listen to on your own time. You can peruse every piece of art in the Broad’s collection and search an interactive map for specific works of art or the nearest bathroom. If you sign into your ticketing account, the app will pull in the QR for your museum admission; there’s even a handy link to schedule your next visit. Basically, download this app before you go and keep it on your phone. When you ride the escalator up to the third floor, you emerge in the very middle of the space with galleries all around you. So... where should you start? The floor is broken up by artist and loosely arranged according to time period. The audio guides—you know, because you just downloaded the app—should lead you in the most logical loop around the space. Even if you don’t feel like listening, take a glance at the playlist to find a sensical sequence. A parking spot at the museum’s own three-level garage will run you $15 for three hours on weekdays and all day on weekends—just make sure to get your parking validated inside the museum. To get there, you’ll have to navigate Bunker Hill’s chaotic tangle of one way streets and multi-level roads first; you’ll find one entrance on West 2nd Street (not the 2nd Street tunnel, but the road above) and the other on Kosciuszko Way, off of Lower Grand, which sits below the museum’s Grand Avenue address. We could spend all day admiring some of the museum’s artwork—seriously, we had to tear ourselves away from Ragnar Kjartansson’s hourlong The Visitors—but found that we were able to see everything in about an hour. Make the most of your trip Downtown—and that lucrative parking spot—by making a day out of it. At the Broad itself, make sure to peruse the Shop and to unwind in the olive tree grove outside. Off property, you’ll find plenty to do within a few blocks. Check the schedule at the Colburn School for any music or dance performances. See the LA Phil next door or, at the very least, take a walk around the Walt Disney Concert Hall and its hidden gardens. Amble a few blocks over and relax in Grand Park, or partake in whatever weekend programming they have planned. Grab a bite to eat down the hill at Grand Central Market. The Broad is as much a destination in itself as it as a piece of a developing neighborhood.